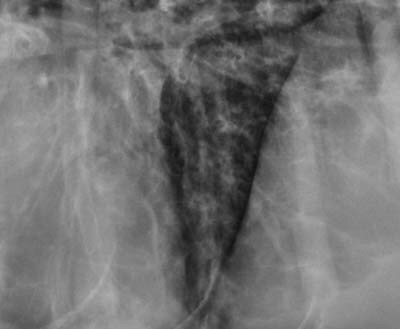 A bronchial pattern on radiographs indicates a condition that involves the airways. It can be a subtle pattern to recognize, so lets look at some of the features. The airways are made out of cartilage which is radiolucent, but they have some surrounding soft tissue structures that can make them visible. The bronchi are normally visible near the heart base where the diameter is still quite large. You might see parallel thin walls with vessels on either side, or just see the airways flanked by the pulmonary arteries and veins. Take a look at this normal thorax for an example. There are some mildly mineralized bronchi which we’ll discuss next. With age, many dogs develop mineralization of the airways and trachea. It is not a normal aging change in cats. Mineralized bronchi are recognizable because of their mineral opacity and very thin, sharp borders. The bronchi are visible farther out in the periphery than in a dog with no mineralization. But any increase in opacity is uniform and very opaque (image 1). In a true bronchial pattern due to infectious or inflammatory disease, the bronchial walls are visible further out in the periphery than usual. Look for them over soft tissue structures such as the heart or diaphragm. They have irregular or indistinct borders, and are visible separately from the vessels that run parallel to them (image 2). The parallel lines you see are called tram tracks, and a bronchus visible end-on with thickened walls is called a donut. It can also be described as a cygnet ring, as it tends to be of non-uniform thickness (image 3). The bronchial pattern is most common in cats with chronic lower airway disease. Their airways are very small, so look in the periphery for donuts and especially on the v/d or d/v projection where they show up better. A magnifying glass can come in handy as well. Chronic bronchial disease can result in bronchiectasis, which is an irreversible dilation of the bronchi. They don’t taper toward the periphery, and can be saccular in appearance. 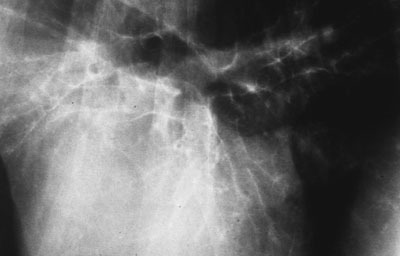 Normal bronchi are flanked by vessels but the walls are not visible. Mineralized bronchi have mineral opacity, sharp, uniform walls. Abnormal bronchi have indistinct, soft tissue opacity, non-uniform walls. Abnormal bronchi are visible in the periphery of the lung. I just printed out this page to keep. 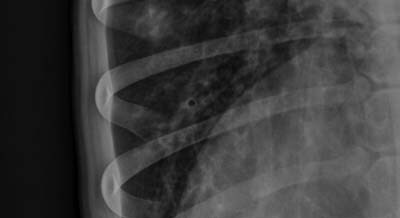 what is the difference between a bronchial pattern and a peribronchial pattern-do they look the same radiographically? I think the terms are used interchangeably. Inflamed bronchi become more visible because of inflammatory cells and fibrous tissue that surround the airways, hence “peribronchial”. This is a great article on bronchial patterns! 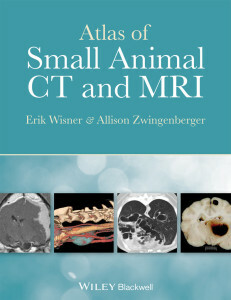 I was wondering if you’d be willing to write one about differentiating between interstitial and alveolar patterns? Or even distributions of increased opacity in the lungs and associated differentials? Dear Dr. Allison Zwingenberger, “bronchial”and “peribronchial” changes are the difference, because it is a different process. Yes, I agree that differentiate this distinction is very difficult. But you will agree that this difference would have been a blur of external or internal contours of the bronchi.